Another typical Chinese bag, 21 vertical lines, but this time with a prancing reindeer. Very nice example of 21st century Chinese Bag design. 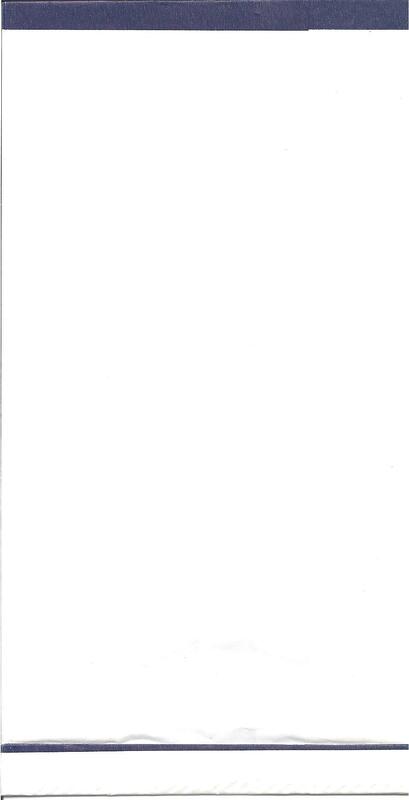 A departure from the boring blue on white. 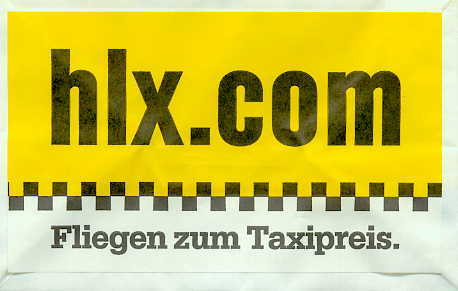 Nonsensical logo looks like a tongue with yellow hair on it. Nonsensical logo looks like a tongue with yellow hair on it. 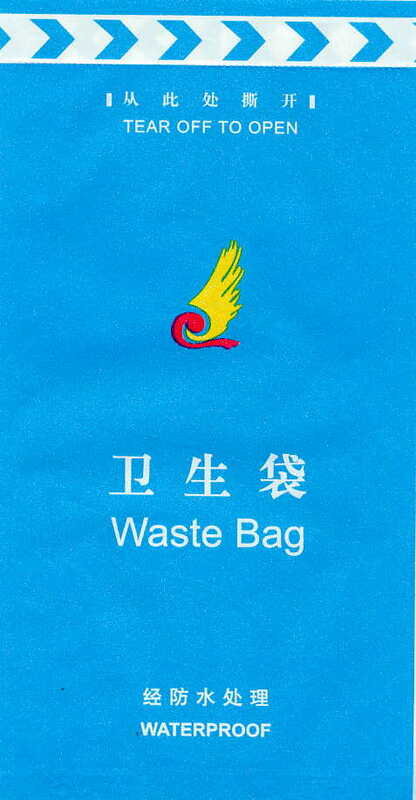 Big changes have been in the works for Hainan, most notably is that they now made the bag Waterproof -- about time! 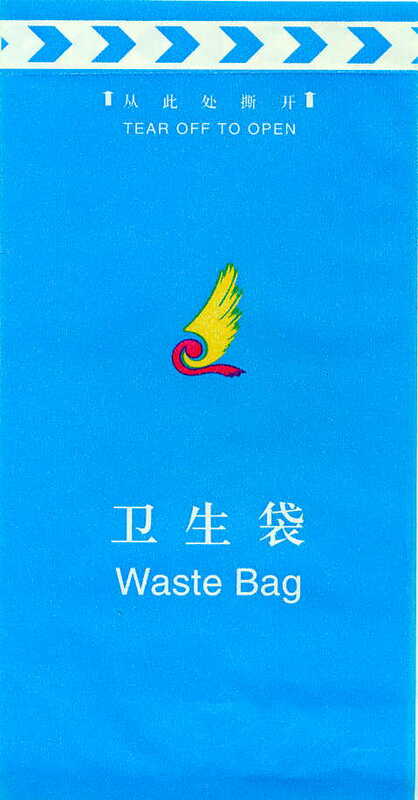 Boldly colored bag for a Chinese Airline with a man-crab logo. 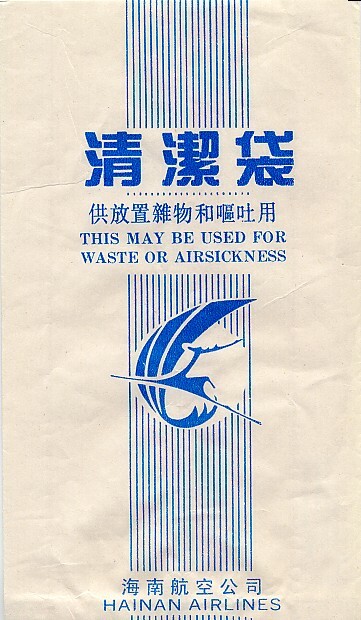 The main thing they want you to know about this Waste Bag? It's WATERPROOF. 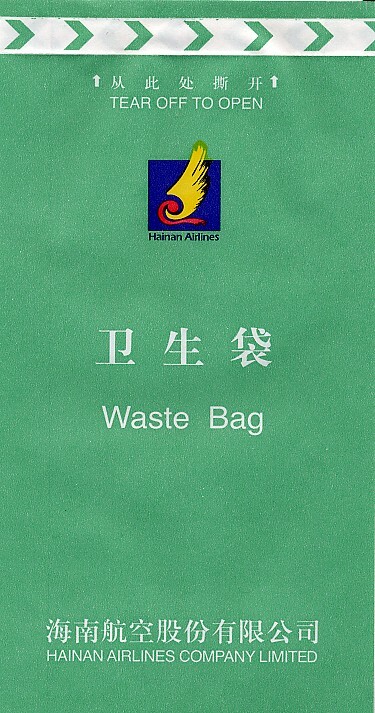 This bag is an amalgamation of the previous 2 hnair bags. It takes its structure from the gray bag but uses the logo and color of the red back to create this not-so-incredible melange. 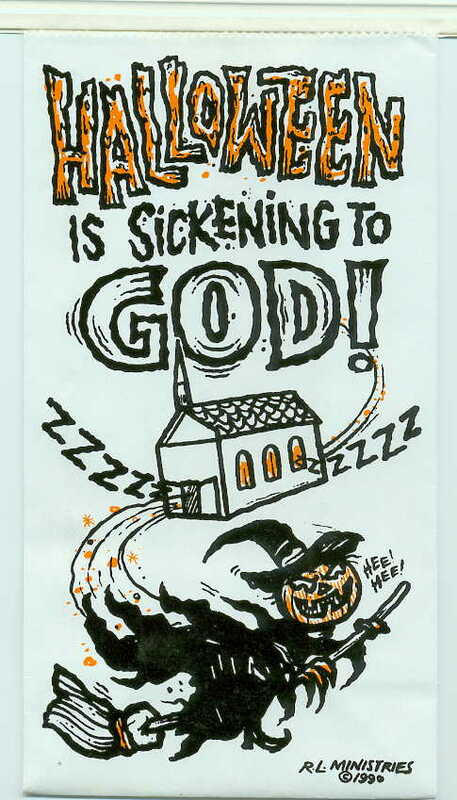 Halloween is Sickening to God! This amazing bag was released by R.L. 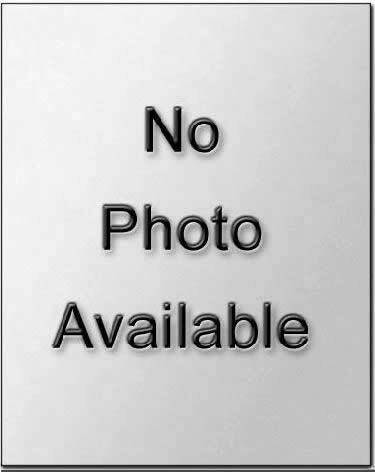 Ministries in 1990 in order to convince people that God hates Halloween. What a great piece of religious propaganda! In fact, a whole sheet of text accompanies the item, explaining in great detail, along with supporting scripture, just what an abomination Halloween is to Christians. 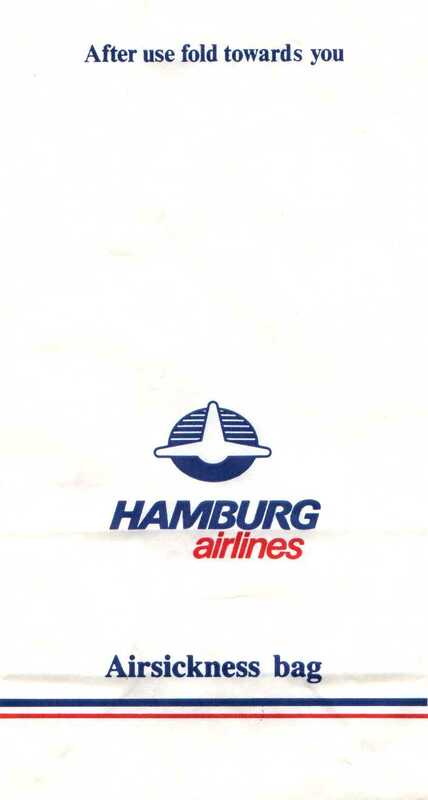 The Hamburg logo looks like an actual hamburger where the patty is replaced by an airplane. 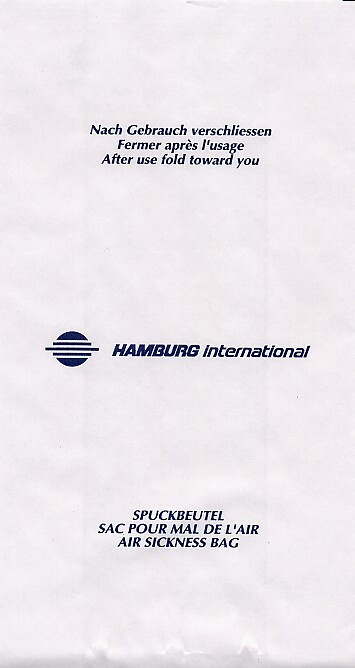 Nice flying hamburger logo, which is appropriate if you call your airline Hamburg. Italics rule! 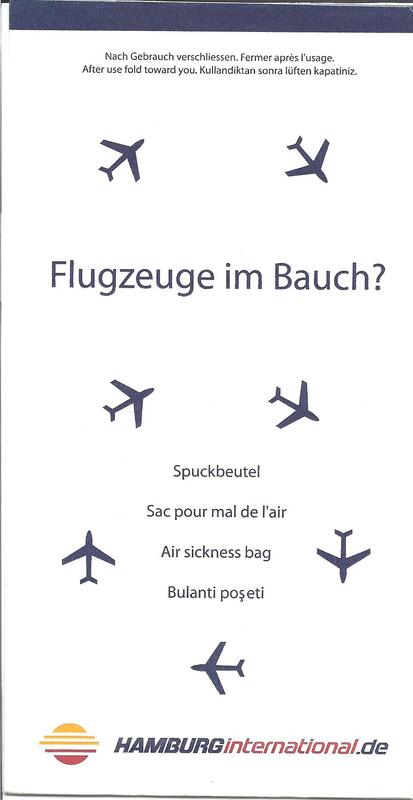 Flugzeuge im Bauch? means Butterflies in stomach? 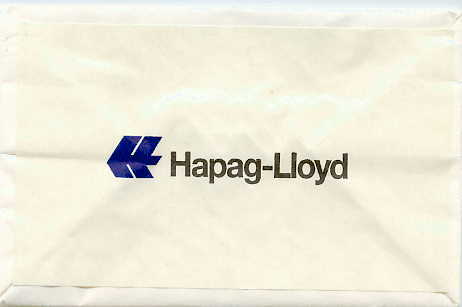 Completely blank white, with the words "Hapag-Lloyd" on the bottom. The Gunter-ACS Pacman appears in the gusset without the words. 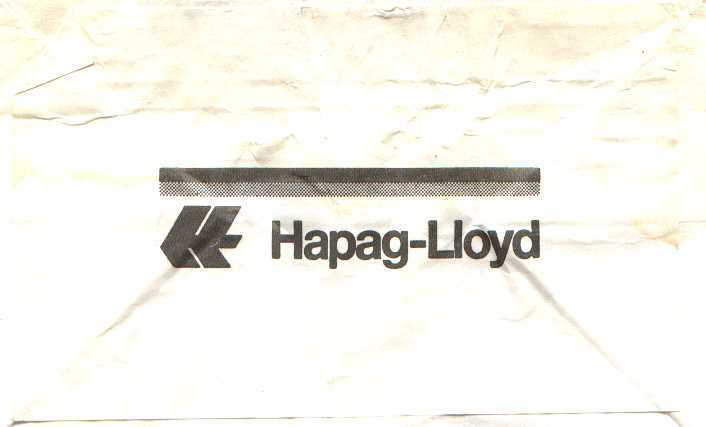 Completely blank white, with the words "Hapag-Lloyd" on the bottom. 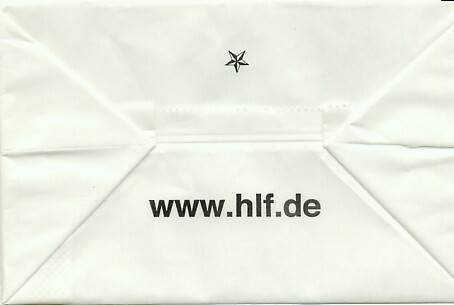 Exactly the same as other 1997 bag except 'ACS Germany' is printed in the fold. 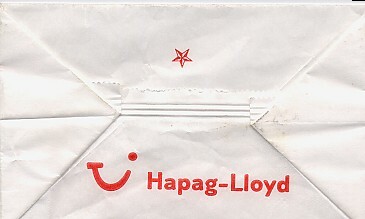 Completely blank white, with the words "Hapag-Lloyd" on the bottom. Much like before except they decided to change part of the logo to be in blue instead of black, although there's no star on the bottom. 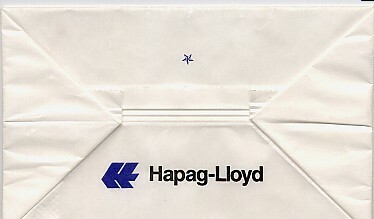 Completely blank white, with the words "Hapag-Lloyd" on the bottom. Much like before except they decided to change part of the logo to be in blue instead of black, PLUS there's a star on the bottom. 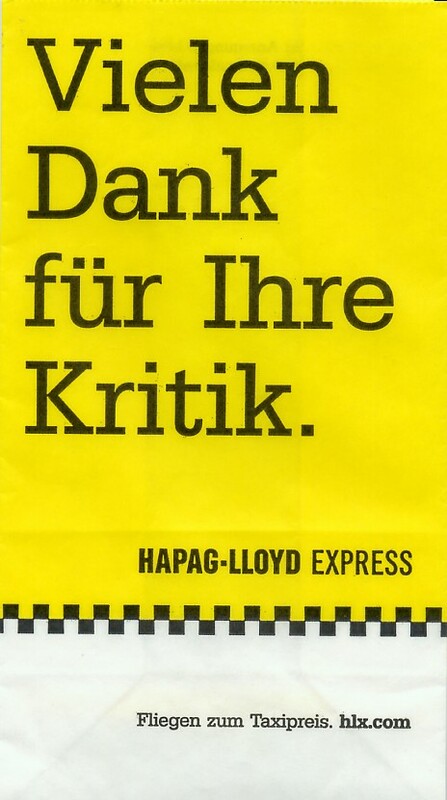 Hapag-Lloyd: Home of the Mutant smiley face! 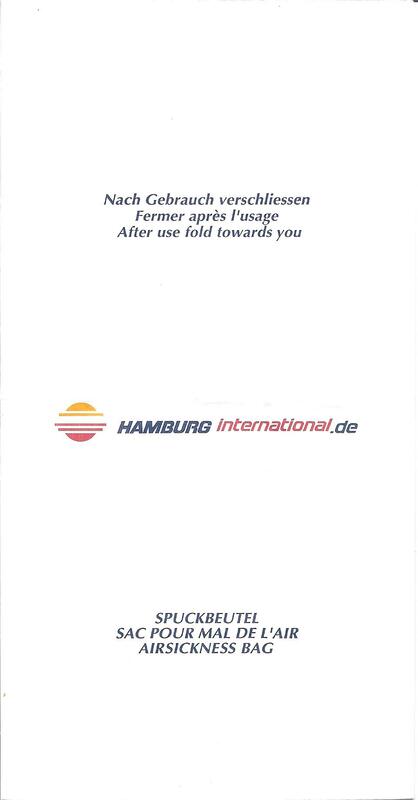 Hapag-Lloyd minimizes their design even more, but adds their web site. 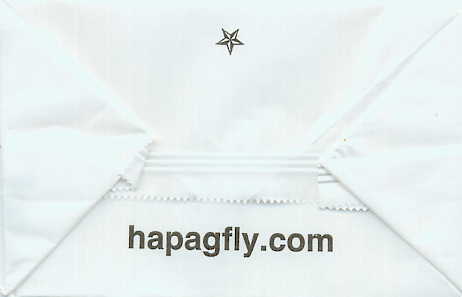 Hapag-Lloyd's web site changes from hlf.de to hapagfly.com, forwarding the former domain to the latter. Vielen Dank für Ihre Kritik means 'Thank you for your criticism'. Whoever wrote these words must have been sending subliminal messages to my mother for many years. 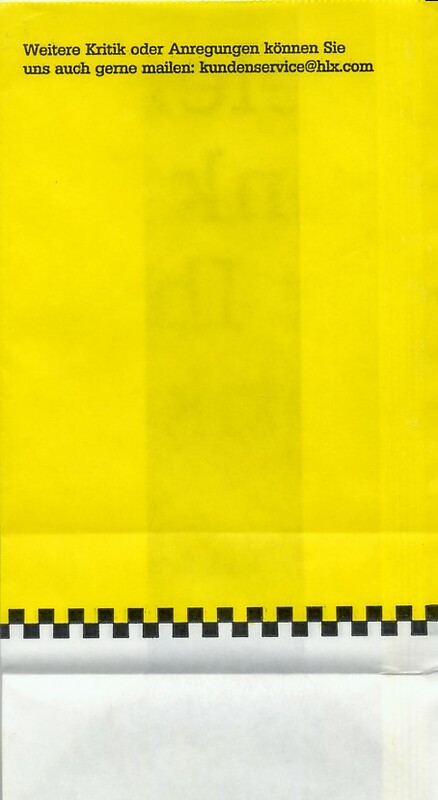 Yellow describes this bag. Just like everything in Texas, this bag is big and yellow. 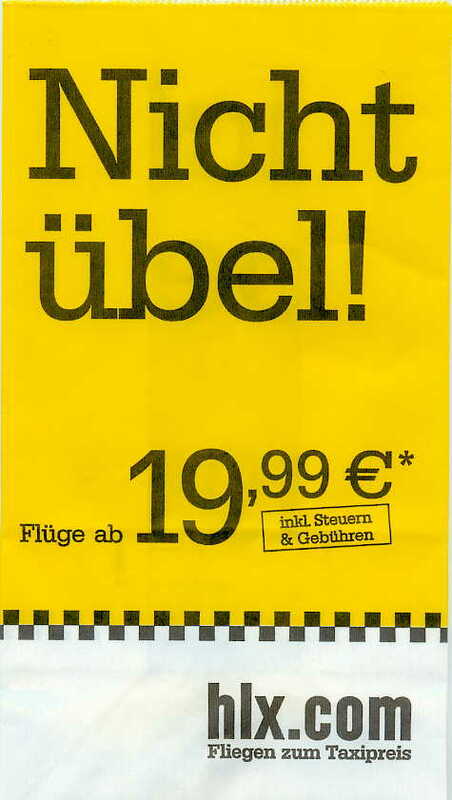 If I read this correctly, you can fly HLX for as little as 19.99 Euros as long as you don't Übel (Nicht Übel). But beware the asterisk which remains unexplained.